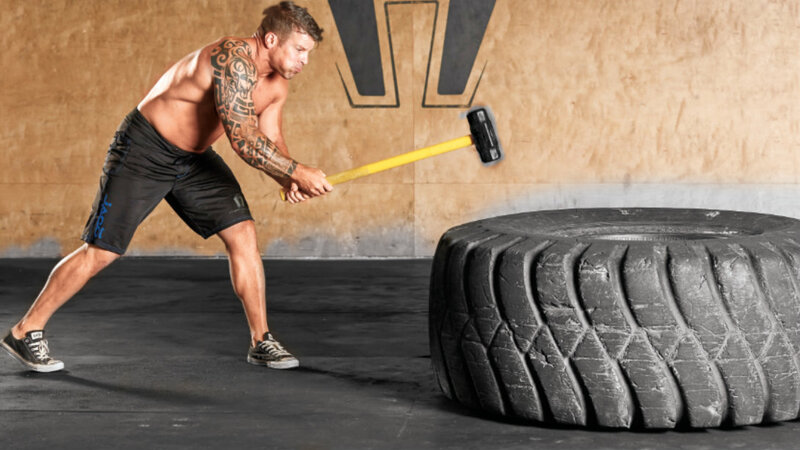 Violently wielding a giant hammer isn’t just a stress reliever but a valuable strength and conditioning tool, too. Some of the strongest people I’ve ever met have never stepped foot in a gym. They are welders or farmers—day laborers who spend their entire lives moving large loads quickly and efficiently. It stands to reason, then, that swinging a sledgehammer with intensity is an effective way to increase conditioning. Even better, it’s just a fun way to work out. The interesting thing about sledgehammer strikes is that it’s hard to quantify how much work someone has done. One hundred strikes for one guy may not provide as much work as it would for another, making total reps irrelevant, and placing all the emphasis on putting in an honest and intense effort. from the tire with your feet a little wider than hip width. Rotate your feet slightly so that your non-dominant side is closer to the tire than your dominant side. 3. HAMMER DOWN: Contract your abs and drive the head of the hammer into the tire, sliding your dominant hand down the handle so that it meets your opposite hand. Control the rebound after each strike. Perform equal reps using your non-dominant side. A 12-pound hammer is ideal for most guys, and old truck and tractor tires are the best striking surfaces—and can be acquired free (or very cheap) in most junkyards. Perform eight, 20-second rounds of swings, each followed by 10 seconds’ rest. Strive for as many max-effort swings as possible in each work segment.